The Duchess of Waverly was showing off when I visited the Rogerson Clematis Garden at Luscher Farm recently. The Rogerson Clematis Garden at Luscher Farm is just another example of how the city of Lake Oswego belies its size. 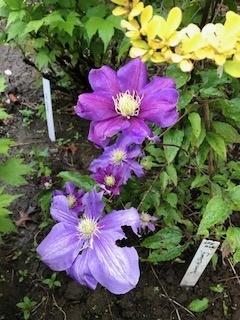 With more than 1600 individual clematis spread on an acre of land surrounding the historic farmhouse, it is the most comprehensive collection of clematis within a public garden in North America. To maintain and nurture this treasure, the Friends of the Rogerson Clematis Collection are holding their tenth annual Inviting Vines Garden Tour and Party on Saturday, May 27 from 10:00 a.m. to 4:00 p.m. featuring the Rogerson Garden as well as four additional gardens that have been showcased in years past. Guests can also enjoy “Breakfast with Mike Darcy,” in the barn for an additional fee. The Rogerson collection was started by Brewster Rogerson in 1971 and made its way from Kansas to Eugene to the Gutmann Nursery in North Plains before finding its home at Luscher Farm where clematis are combined with other plants in a residential setting to inspire visitors to incorporate them into their yards. Volunteers update what’s in bloom on a regular basis, and with the variety planted there, it seems that something is always showing off its color. Why all the fuss about clematis? They are visually stunning—I’ve been known to purchase a couple for my yard after being dazzled by their display in local nurseries. They come in a variety of colors as well as shapes and sizes. Flowers can be as wide as one to five inches across and the plants can range from one to thirty feet tall. Don’t take my word for it. Buy a ticket for the Inviting Vines Garden Party. Cost is $25/person; $50/person for tour and breakfast with Mike Darcy (seating is limited and tickets only available on line until May 23). If you can’t make the event, just check out the “What’s in Bloom?” page on the collection’s website and head over to Luscher Farm at 125 Rosemont Road to see for yourself. Hours are 8:00 a.m. to dusk everyday. This entry was posted in Lake Oswego Parks, Things to Do in Lake Oswego and tagged Inviting Vines Garden Tour and Party, Lake Oswego Oregon, Rogerson Clematis Garden. Bookmark the permalink.